Educating for Excellence’s Graduate Program accompanies our graduates after they’ve completed E4E’s educational program at the end of 12th grade. The Graduate Program provides a personal support package, tailored to the graduates’ needs, and invests considerable resources in ensuring that each and every one of our graduates is able to reach their full potential. > Integration into meaningful positions in the military or national service. > Scholarships for Psychometric studies (SAT equivalent). > Educational counseling and assistance in perusing academic studies. > Career counseling, community involvement opportunities, etc. High School Matriculation Entitlement | 97% of E4E graduates are eligible for a full matriculation (Bagrut) certificate. Matriculation Scores | 77% of E4E graduates take the high-level math matriculation exam. Army and National Service Recruitment | 96% of E4E graduates (candidates for security service) serve in the IDF or in national service. Academic Studies | E4E graduates study in leading academic institutions. Employment | E4E graduates work in a wide variety of positions within leading Israeli companies. 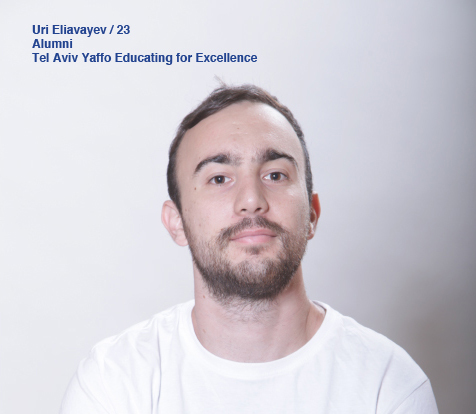 Social Involvement | E4E graduates are involved and contributing citizens who care about Israeli society, and some volunteer as students-instructors at E4E’s centers.